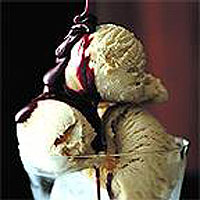 This luxurious sauce is fabulous with vanilla or white chocolate ice cream. It can be stored in the fridge for at least a week. Combine all the ingredients except the vanilla in a heavy-based saucepan. Heat gently over a low heat, stirring until the sugar has dissolved. Turn up the heat and bring the sauce to the boil. Reduce the heat and continue to boil gently for 10 minutes. Remove from the heat and stir in the vanilla essence or seeds.